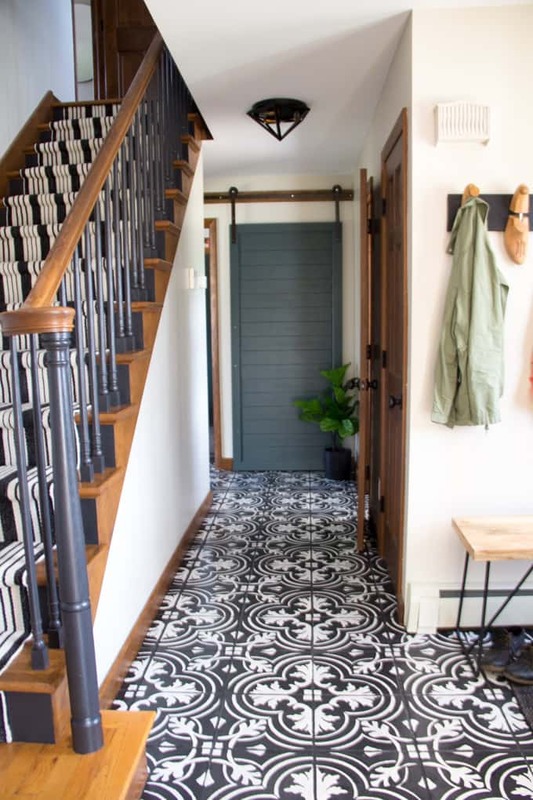 A few weeks ago I shared our new modern flush mount lights, and my plans to paint the tile floors in our entry. 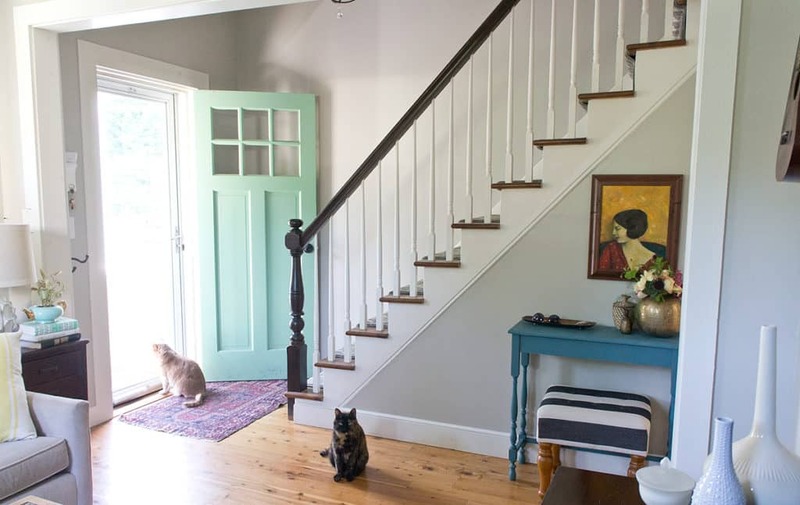 Although the painting hasn’t started yet, I can’t help but make plans for painting the stairs as well! 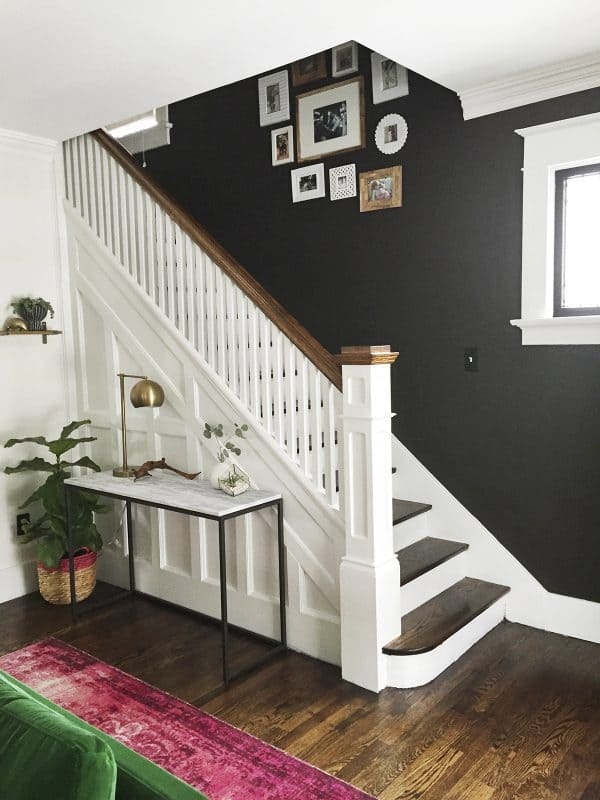 I know that I’m not going to paint everything, but I’m having a hard time deciding what color to paint, and what parts of the stairs to paint. One thing I AM certain about is that I’m going to use this runner on the stairs. 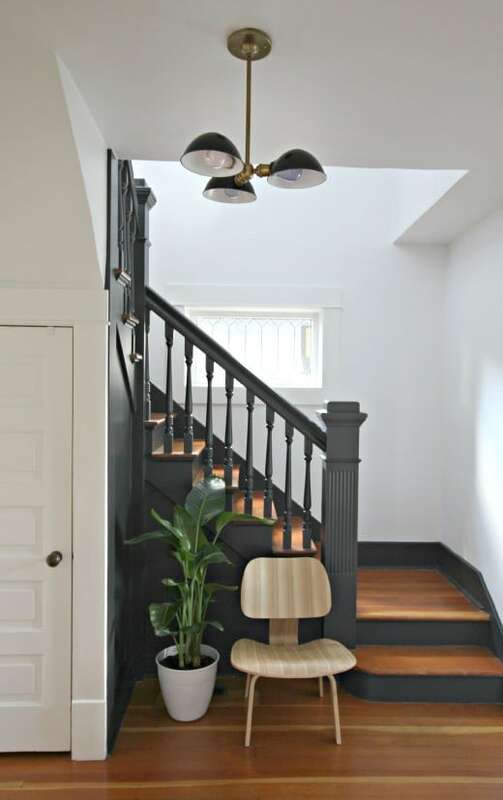 For this staircase they painted the spindles white, as well as the side of the stairs, and I LOVE how it modernizes the stairs. I’m also LOVING the black wall, but I’m afraid our entry just isn’t bright enough for a black wall. 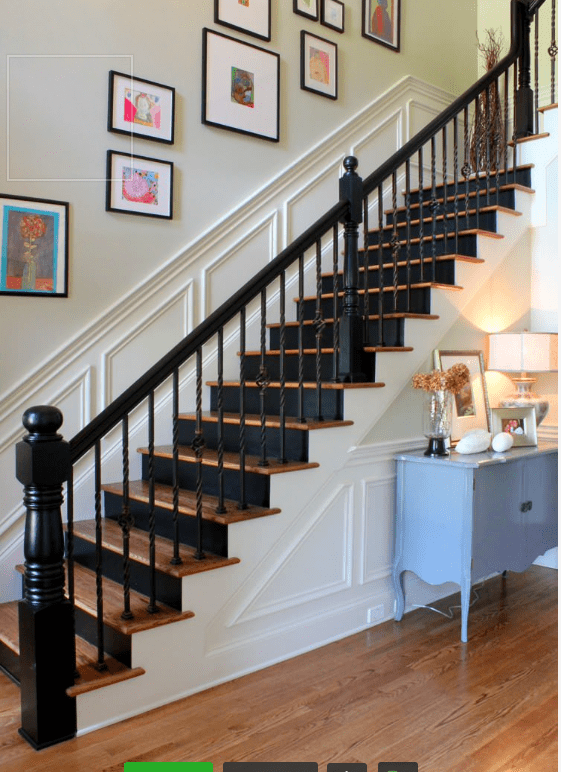 In this next space she painted everything other than the stair treads and the rail. 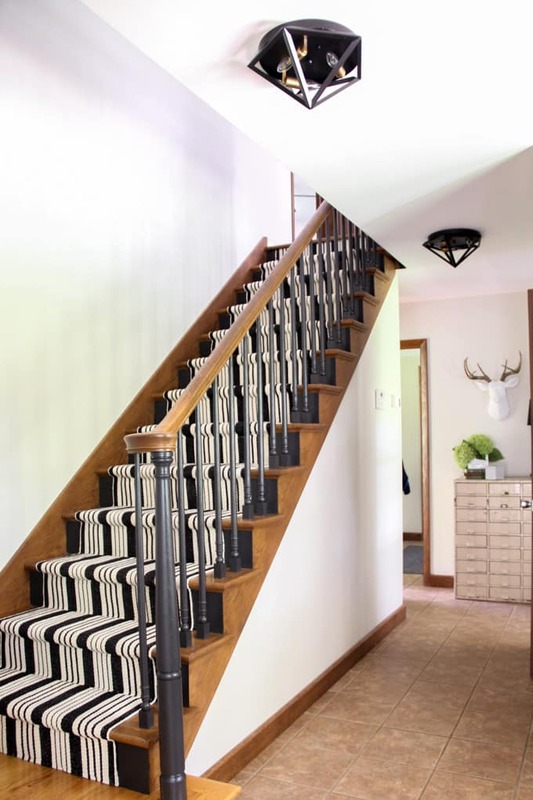 I really like the white on the upright portion of of the stairs. Here’s another example of everything other than the treads and handles being painted white. My only fear is that this might be too much white? Especially with a light colored wall. My friend Karen painted her staircase white with a light wall, and I definitely wouldn’t say her space is too light. 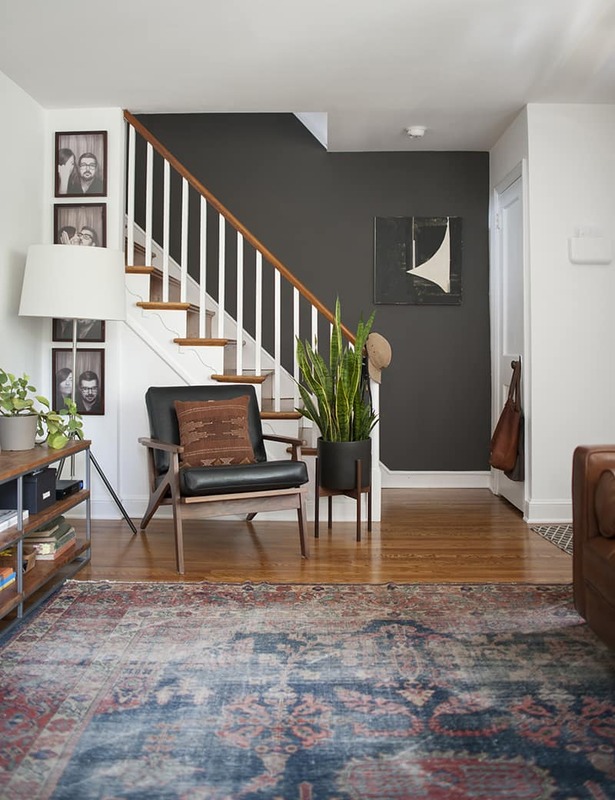 I’m also considering going bold and dramatic with black paint rather than white! I LOVE how dramatic this stairwell looks with everything other than the treads being painted dark. Here’s another example where they used black, except they went white on the side of the staircase. I think it looks beautiful, but I’m afraid if I use black and white it may not all flow as smoothly? So now I need some help! Should I go black or white? 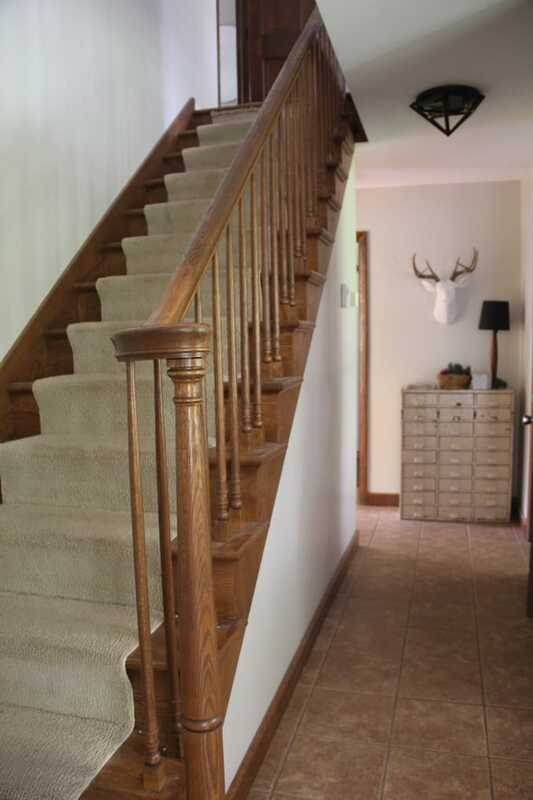 Should I paint just the spindles, or the backs of the stairs as well? I know that it is going to be a LONG time consuming project, so I want to make sure I get it right the first time! **11/17/16 Update** We ended up doing black spindles, and black uprights, while keeping the treads wood. Here is the post with all the details! Of course I added one teaser pic for you too! **7/31/17 Update** We ended up painting the flooring in this hallway and I just had to share an updated shot! I vote for all black except the treads – tres sophisticated. Thanks! I’m thinking Black is the way to go too… a unanimous Facebook and instagram response too! What did you end up doing? I agree with the first comment: all black, except for the threads! I ended up going black on the spindles and uprights, and keeping the treads and rail black. I’ll add an “after” link into this post. Thanks for stopping by!